As a PTC partner who has developed 14 data exchange plug-ins for Pro/ENGINEER, I was a little concerned about the way PTC decided to turn their product line inside out and do away with the Pro/ENGINEER brand completely. The day PTC announced Creo, they also announced that Pro/ENGINEER, CoCreate and ProductView were being renamed with immediate effect. I visited PTC.com to see if new builds of the products were available for download but couldn’t find any. Last night I noticed that Pro/ENGINEER Wildfire was replaced by Creo Elements/Pro in the PTC.com download area. I went ahead and downloaded the 3.3 GB installer. I wanted to check if PTC had done something that would make my Pro/ENGINEER plug-ins stop loading or not work properly. I also wanted to know whether the time had come to rename the “… for Pro/ENGINEER” in my product names to “… for Creo Elements/Pro“. As it turns out, apart from a new splash screen, nothing much has changed. PTC didn’t even bother to change the name of the application in the title bar. It still reads Pro/ENGINEER. The first thing I did was load one of my plug-ins to check if it was working. To my relief everything worked just fine. Since PTC hasn’t done anything to the UI to this build, like adding a ribbon, my plug-in was able to load its own menu without a problem. So if you are a SYCODE customer using one of our Pro/ENGINEER plug-ins, you can safely update your Wildfire 5.0 installation to build M065. I didn’t change my plug-in at all. It worked out of the box. However, if you use plug-ins from other PTC partners you may want to check with them first. I guess I won’t be renaming my plug-ins to “… for Creo Elements/Pro” anytime soon. When PTC does come out with the real new Creo next year that will probably be the time that I will change my product names. Come to think of it, I am not sure what was the need for PTC to switch to the Creo name now, especially since they are not changing the software at all. It just adds to the confusion. 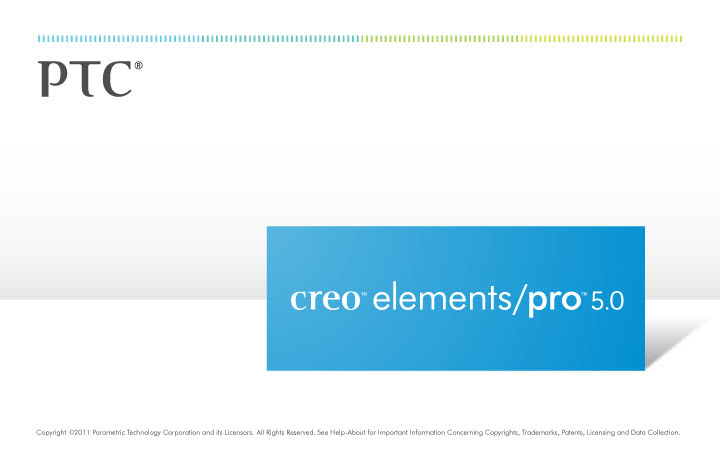 The fact that the splash screen says Creo Elements/Pro and everything else, including the About box, says Pro/ENGINEER sounds a little weird to me. Uncalled for, actually.